21/5/12 - Appointment - Paris, Mobilier National - The exhibition which recently opened at the Galerie des Gobelins, in its Parisian version, Poussin et l’histoire de Moïse (see new item in French) is accompanied by a momentous event for the history of this institution with the retirement of Arnauld Brejon de Lavergnée, director of the collections at the Mobilier National since 2003. He will be replaced by Christiane Naffah-Bayle, heritage curator. She had been Directrice scientifique for the Centre des Monuments Nationaux since 2010, before spending almost five years as head of the Centre de Recherche et de Restauration des Musées de France. 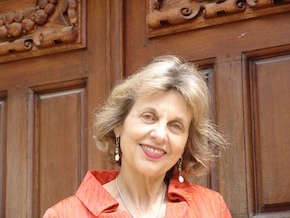 Initially specialized in Islamic art - she was curator in charge of the Islamic collections at the Louvre for two years, from 1979 to 1981, then moved on to the Musée de l’Institut du Monde Arabe where she acted as curator then director from 1982 to 1991 - Christiane Naffah turned to the restoration of paintings at the Service de Restauration des Musées de France. Between 1998 and 2005, she also worked at the Musée du Quai Branly where she supervised the preparation for the Collections there as well as the annex at the Louvre. The Mobilier National will provide her, no doubt more than at other museums, with the possibility of working on this double aspect of conservation and restoration. Indeed, the project initiated by Arnauld Brejon de Lavergnée on the tapestry cartoons, long forgotten in storage, has just started and there are many more works still to be restored. We would thus like to commend her predecessor who, alongside the administrator Bernard Schoetter, succeeded in reopening the Galerie des Gobelins, organizing many fascination exhibitions there drawing from the Mobilier National collections, as well as carrying out countless restorations which often served to save certain pieces. Arnauld Brejon de Lavergnée will not however remain idle for long as he is to finish his project of a catalogue raisonné for the work of Simon Vouet.